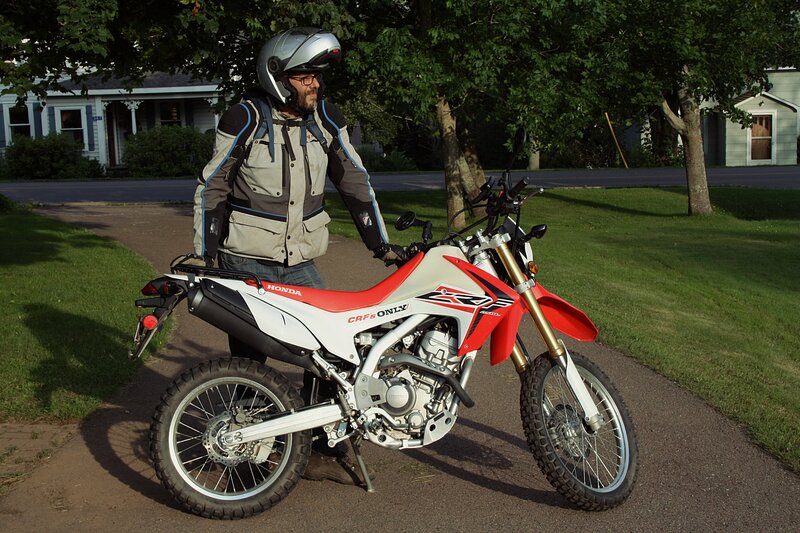 In the last update we took the CRF250L into the trails in out-of-the-box, naked-as-the-day-it-was-born format because all the bits we were eagerly awaiting from CRF’s Only had decided to get to Sackville via a comically tortuous route and didn’t arrive in time. Of course, they were waiting for us when I pulled in from the scouting, so I roped in Assistant Editor Zac Kurylyk to help me slap on the parts and then took it out for another scout (this time not holding back in the rockier sections) to see how it all faired. The process for installing the CRF250L farkles was surprisingly painless. We started around mid-afternoon and were done by supper, so except for the Acerbis handguards, we had all the parts fitted in three hours, including time for finicky bits. We’ll go over each part fitted and list its retail price in US dollars from CRF’s Only below. We do have Race Tech front fork valves and springs as well as a Race Tech rear shock, but I want to put some miles on the standard suspension before upgrading so I can get a good feel for the differences. Generally speaking, these parts were not the most expensive available from CRF’s Only. We went for items we felt offered buyers the most value for their dollar, as not every reader is a big-shot motojourno who gets parts for free (ha!). We were particularly impressed by the value offered by the Flatlands Racing bits. The CRF250L skid plate we ordered was a fairly painless installation. Compact and bijou. I love a plate that keeps it to the minimum and the Flatland Racing plate does just that. Beefy enough to handle a beating, but compact enough it doesn’t add unnecessary bulk. Installation was very straightforward – only two Allen bolts at the front (recessed so they don’t show) and two milled aluminum clamps at the rear hold the unit to the bottom of the frame. It looks like it covers all the important bits, I even did a quick oil change and the access hole lines up perfectly. With it fitted, I didn’t hold back in the trails and pretty quickly took a good thwack at the rear of the right side which was enough to bend the plate and loosen the back mount, but it sure saved the frame, so full marks during the first real test. There are several different skid plates available for the CRF250L at this point, but Zac picked this one as it seemed to offer a good blend of value and protection. A skimpy, wimpy plate doesn’t save you much money if it fails, but an oversized plate can be overkill on the trails, added weight and your wallet. So far, this unit seems like the perfect compromise. The Acerbis handguards don’t require any trimming of levers. In previous projects I’ve used Barkbusters, which do the job, but the Acerbis X-Factor handguards get it done with finesse. They ooze quality when compared to the simplistic BBs, with a sturdy aluminum bar curved perfectly to keep snug to the handlebar but not interfering with the levers or requiring for their ends to be removed. And they look damn good too. CRF’s Only sent along an open-ended throttle tube to avoid having to cut the standard one but I did need to cut the ends of the grips off (easy) and remove the throttle assembly to fit them (easyish). The plastic guards should offer good wind protection too, but I need to ride on a cold day before I can report on that. There are many cheaper handguards available on the market, but these are the ones CRF’s Only recommended we try. They’re expensive, but seem to be top quality. Cheaper made-in-China units can fail on the trail (we’ve seen it), so the added expense could be worth it in the long run. The Flatlands Racing rad guard is a much sturdier piece than the puny plastic guard Honda sends with the bike as stock. The guard also offers protection on the side of the radiator, which the Honda OEM piece doesn’t. Having only one radiator means you only need one rad guard and the Flatland Racing guard protects the radiator from flying rocks, but also offers protection against crushing if dropped, something the original plastic unit does not do at all. As the guard is larger than the original plastic bit, it interferes slightly with the bigger IMS plastic fuel tank and required a very gentle tap with the Harris hammer in order to give it enough clearance. You can’t blame anyone for this, as accessory makers can only design to the original equipment not other accessories, but a few ‘gentle’ taps was all it took to get it right. Thankfully I haven’t had to test its effectiveness yet (and hope I don’t have to). It does seem like a well-made piece of kit and designed to take a good dose of force before giving. It offers peace of mind in the bumpy bits, since a busted radiator ends your day pretty quickly. Fitting the new tank was a fairly simple process, although the IMS instruction sheet would have benefited from some good pictures. Of all the parts we fitted, this was the unit that I was most interested in. The CRF’s standard fuel tank is only 7.7 litres and severely limits the range of the bike returning between 18.9 and 22 km/l – not great for exploring trails when you don’t know for sure where the next gas stop will be. The IMS tank boasts 11.75 litres which should give a range of up to 250 kms, depending on throttle action. The IMS tank didn’t quite line up with the Flatlands Racing radiator guard, but a bit of work with a hammer fixed that problem. Fitting it requires some mods, so you need to be confident. First, remove the fuel pump from the original (note to self: do not fill up the tank just before doing this) and fit it to the IMS unit; then you’ll have to bolt on the various mounts. Next, find a big hammer to ‘adapt’ the Flatland Racing rad guard and then bolt it into place. Since the IMS tank gains its extra capacity from being wider and a little taller, the original equipment plastic side covers need to be trimmed with a box cutter to fit snugly. It’s surprisingly easy to do and once done the tank looks almost original. We went for the semi-clear option which enables you to see your fuel level. After trimming, the stock bodywork fits the IMS tank nicely. Initially, you notice the extra splaying of the legs, and when standing your knees now grip the sharpish edges of the tank (IMS could have scalloped the sides a little for a minimal loss in capacity), but it’s a minor price to pay in exchange for the extra range. You also lose the lockable cap, which may or may not be an issue depending on whether you park your bike in a neighbourhood of gas thieves. Other companies offer locking gas caps for the IMS tank, if it’s a concern. 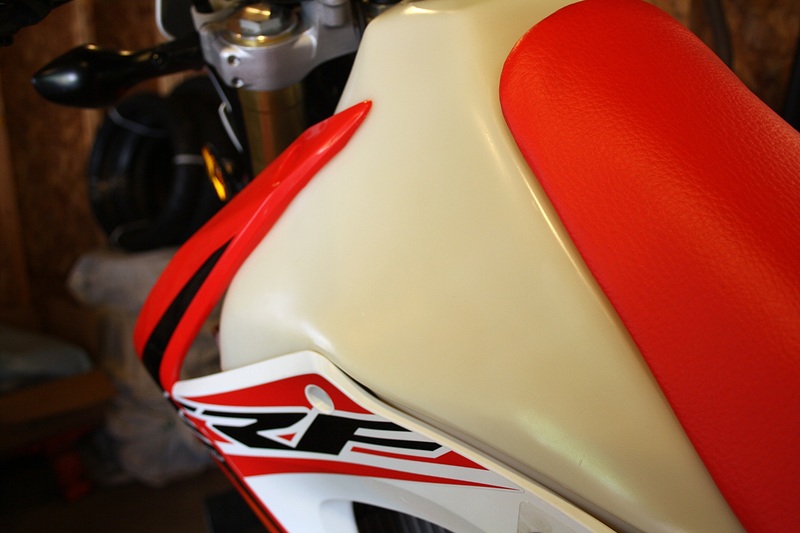 Acerbis also makes a fuel tank for the CRF250L. It’s more expensive and offers the same capacity and requires you to reverse the fuel pump to install it (not a big deal). We went with the IMS tank because it seems to offer more value for someone who’s working on their own bike on a budget. A pretty basic rack, but it does the job well. Why aren’t these stock equipment? Perfectly sized to sit over that expanse of plasticky rear bodywork, the CRF’s Only rack looks like original equipment and gives basic carrying capacity for the Little Red Pig. Easy to fit (if you bolt it up in the right order) the only downside I’ve found is that if I slide my arse to the rear of the seat I do hit against the front mounts, otherwise, all good. Someone who isn’t awkwardly tall might not have such issues. Flatland Racing also sells a nice rack for the CRF250L at an even lower price ($75ish). However, the rack we chose looks like it might be a little easier to use as a grab handle to remove the bike from a muck hole (it happens). Also, there’s an accessory plate available that lets you attach a Rotopax fuel can, further increasing your range in the woods. If you don’t want to spend the cash on a bigger tank because you rarely need more than 120 kms of fuel, this could be a smart way to prepare for those occasional forays outside your normal fuel range. The Double Take mirror cleverly combines a RAM fitting with the OEM mirror mounts. What an interesting way of making foldable mirrors! The Double Take mirrors utilize RAM mount arms to bolt onto a ball that screws into the mirror mount at one end and hold the mirror at the other. Not exactly pretty, they do make for easily adjustable and foldable mirrors for when you hit the trails. The downside is, like most folding mirrors, they tend to vibrate and give a fuzzy view of what’s behind especially when the speed picks up. CRF’s Only has a lower price than competitors on this item but they still aren’t cheap, at $23.75 each. However, they are very solid and if you want a dual sport mirror that’s beefy enough to handle a bit of rough use, they were recommended to us as the way to go. The stock rad guard only serves to deflect small flying rocks. Now that’s what a good aftermarket farkle instruction sheet should look like. It’s a good idea to add a little lubricant to your bike’s top end to keep the piston and rings free in the bore. For some reason, Honda didn’t make the stock fuel tank big enough for any real range. Make sure the plates, registration and other documents are in order before you leave. Editor ‘Arris removes the stock CRF250L fuel tank. Shame, IMS! CRF’s Only offers far superior instructions for their steel luggage rack – the photos mean even an idiot could install it with no trouble (which he did). Steady now! Editor ‘Arris trims the bodywork back to fit it around the tank. Get up close and personal to check out all nooks and crannies of the bike. The devil may be in the details. The Double Take mirror cleverly combines a RAM fittingwith the OEM mirror mounts. Close-up details shots like this will give you a very good idea as to what shape the bike is in. With the CAD in the crapper offerings from Canadian co Emperor Racing is a good alternative. I understand CRF’s Only do not carry them. It’s certainly worth noting that the CAD’s demise will affect value. It was not in the crapper when we started planning this project, but that changed fast.